Why do cats purr? Why do cats get stuck in trees? Why do they bring us their latest catch? Why do cats always land on their feet? Learn the fascinating and sometimes surprising facts about these and 36 other curious cat behaviours; light-heartedly explained and beautifully illustrated in this book. 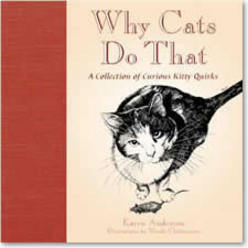 Author Karen Anderson and illustrator Wendy Christensen are both sincere cat-lovers whose admiration and devotion to their feline companions are sure to strike a chord with everyone who has a cat (or many cats!) in their midst. Why do cats purr? Why do cats get stuck in trees? Why do they bring us their latest catch? Why do cats always land on their feet?